FLAVORS (Recapping The Music Of The 90’s Era…The Golden Years), is an event conceptualized by the innovative minds of KeiStar Productions. 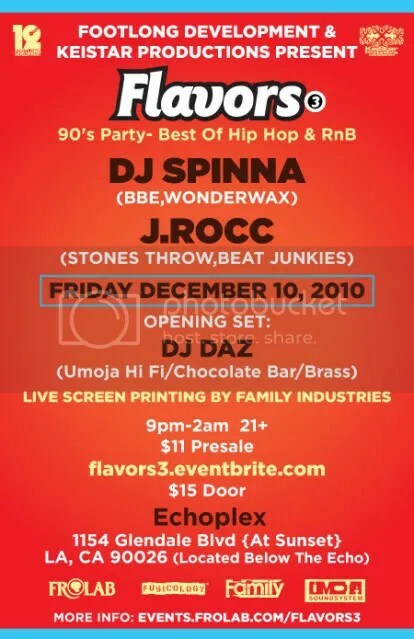 The first installment of FLAVORS dates back to 2002 and was celebrated with none other than the incomparable DJ SPINNA. With his extensive record collection and music knowledge DJ SPINNA creates havoc on the dance floor by spinning the unforgotten hits of 90’s Hip Hop, R&B, Dancehall and House Music with a seamless thematic mix. KeiStar Productions & DJ SPINNA went on to conquer the New York City club scene with FLAVORS and have invited guest DJ’s such as QOOL Marv, Rich Medina and DJ Scratch (of EPMD) to accompany them. 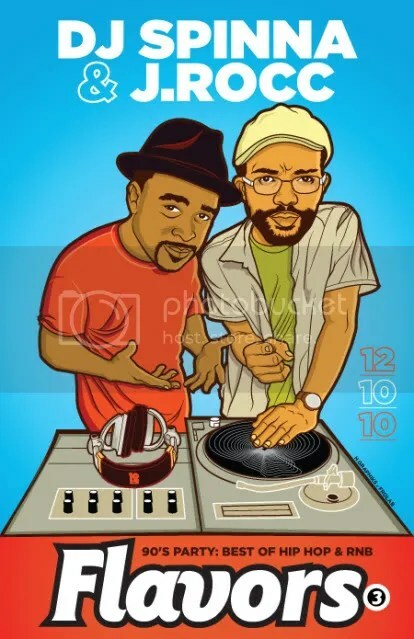 Last year we brought DJ Spinna, J.Rocc & DJ Scratch together for a sold out event…this years event brings back 2 of the world’s best club djs together, DJ Spinna & J.Rocc. Opening set by LA Vet, DJ Daz. DJ Spinna is something of an anomaly in music. A humbling example of what it takes to truly succeed within the framework of multiple fields. A steadfast work ethic, an obsessively extensive vinyl library and the willingness to pursue the full extents of his roots (Funk, Soul and Jazz), foundation (Hip-Hop) and future (Electronic/Dance music) with no restraints. Regarded as one of the most versatile and talented producers/remixers/DJs in today’s musical arena. he has produced numerous tracks and remixes for notable artists such as Michael Jackson, De La Soul, Mary J. Blige, Mos Def, Eminem, George Michael & Stevie Wonder. Also performing/working along side Spike Lee, Q-Tip, Stevie Wonder and many other world talents. One of the original turntablists, J. Rocc founded the Beat Junkies in 1992 with Melo-D and Rhettmatic, but has done just as much on his own as in a group setting. He began DJing in the mid-’80s with a California group named PSK. Soon after forming, the Beat Junkies became a seminal force in the rise of instrumental hip-hop, including core member Babu plus future stars Shortkut and D-Styles. In addition to numerous mixtapes and his own production for Stones Throw releases, J. Rocc has been the DJ for Madlib’s live shows since the early 2000’s, was the 3rd member of Jaylib (Madlib & J Dilla) during the group’s live events, and collaborated with Madlib on Beat Konducta Vol. 5-6: A Tribute to J Dilla. During the early nineties Daz was invited by DJ Marques Wyatt to spin the opening set at the now the legendary weekly acid jazz club Brass. The grooves at BRASS were universal and the streets were watchin’. Jamiroquai, Digable Planets, The Brand New Heavies, The Roots, The Pharcyde, Big L, Guru’s Jazzmatazz and many others did their first shows in Los Angeles and on the west coast via BRASS promotions as the Brass DJ’s could be seen holdin’ it down on the turntables with blazin’ DJ sets. Daz then went on to spin parties for Sade, Rage Against The Machine, Macy Gray, Lenny Kravitz, Ghostface Killah, and the Coachella arts and music festival among others. Never one to fall short of his endeavors, and always through his love of music DJ Daz moved on to become a resident DJ for Chocolate Bar, one of Los Angeles’ longest running true school hip hop clubs. Chocolate Bar garnered rave reviews in local and national publications as the place to be; a virtual melting pot of local people and artists to watch out for. Jill Scott, Mos Def, and Slum Village all did impromptu sets at Chocolate Bar. And celebrities. Zach De La Rocha (Rage Against The Machine), Vince Vaughn, and even Ellen Degeneres were seen rubbing elbows at Chocolate Bar with Hip Hop fans and music lovers. 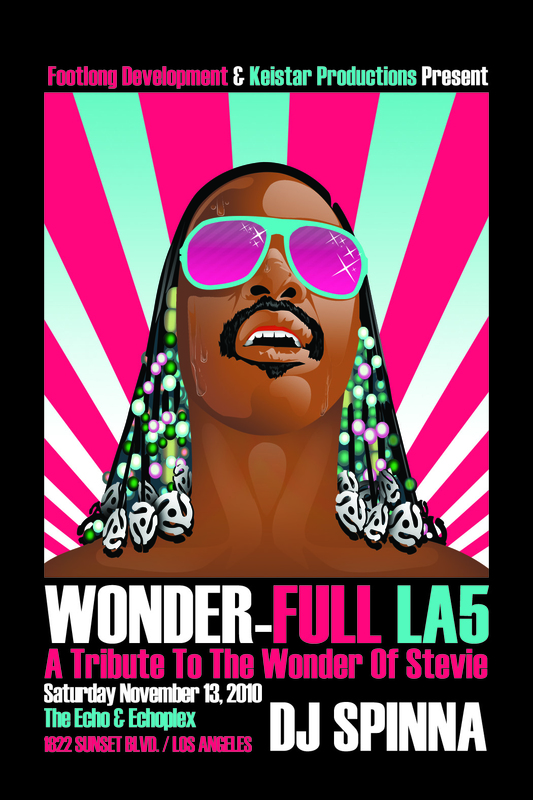 Wonder-Full is an annual event dedicated to the great Stevie Wonder. Featuring New York native DJ Spinna, one of the world’s most respected DJ/Producers/Taste makers, spinning all Stevie exclusives, covers, samples & remixes. KeiStar Productions has successfully produced this event since 1999 starting in its hometown of New York City. From then on KeiStar Productions has traveled nationally and internationally with WONDER-Full™ to Los Angeles, San Francisco, Philadelphia, London, Japan, and Amsterdam. 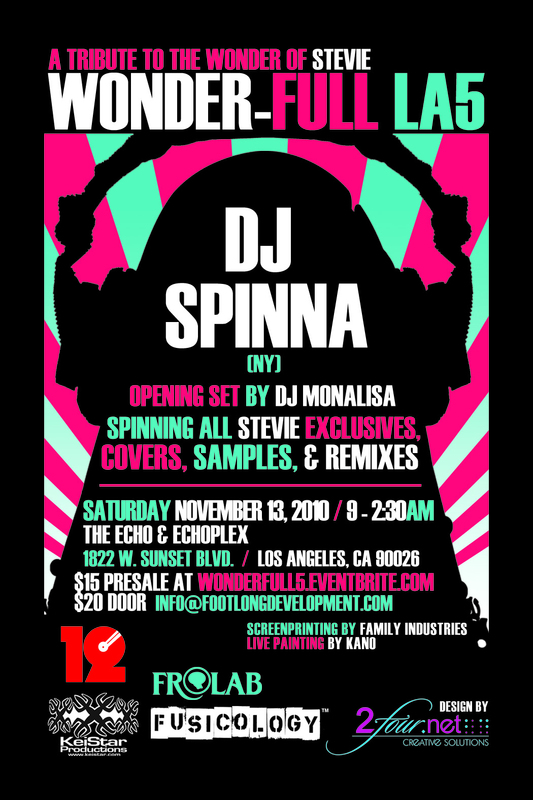 Also featuring Monalisa, one of LA’s most talented mixers. Making its fifth trip to LA , Wonder-Full has united Angelenos and travelers alike, lending to one of the most energetic events this city has ever experienced. Attendees ranged from Prince to Jude Law, along with LA’s top taste makers and music fans, for a crowd of 1,300 smiling faces.